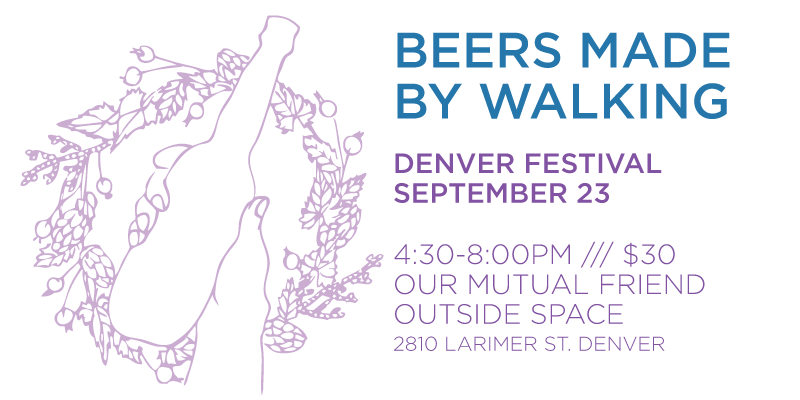 Beers Made By Walking: The 2015 BMBW Denver Beer List is Here! The 2015 BMBW Denver Beer List is Here! The Beers Made By Walking Festival is less than 10 days away and we are excited to share the beer release with you all! GET YOUR TICKETS TO BEERS MADE BY WALKING DENVER! The list features 34 place-based beers from around the country. The beers will showcase the edible plants that grow in our country as each beer is an homage to the landscapes and communities where each brewery resides. Boulder Beer - Honey Hips Brown Ale - Honey brown ale brewed with pine nuts, toasted sunflower seeds, wildflower honey, and rose hips added. Inpsired by an urban hike through Boulder with Gone Feral. Breckenridge Brewery - Gooseberry Gose - Inspired by a stroll down Main Street Breckenridge, the tartness from the gooseberries adds complexity to this salty and already tart beer style. Dry Dock Brewing - Hampden Corner Lavender Saison A crisp saison with lavender harvested right by the brewery. Elevation Beer Co. - Wild Raspberry and Mint Porter - A porter brewed with both wild raspberries and wild mint harvested near Boss Lake. Fieldhouse Brewing - Squawbush Saison- Made with berries from the indigenous squawbush, they provide a strawberry lemonade-like flavor and sourness to the already sour saison. Odd 13 Brewing - Gooseberry Saison Inspired by a walk in Cañon City on a hot July day, gooseberries were added to a sour Saison aged in Chardonnay barrels and then dry-hopped. Strange Craft Beer- Clear Creek Fresh-Hopped Pale Ale inspired by a hike along Clear Creek with wild hops that possess both American and Old World characteristics. Wicked Weed Brewing - Terra Locale: Brettaberry Brettaberry - A tart farmhouse ale inspired by freshly baked berry pie. Featuring a half-pound per gallon of strawberries, blueberries, and blackberries, the acidity of the berries with the rustic funk of our house culture are rounded by the flaky crust finish of Haw Creek Honey, Riverbend Pilsner and wheat malts. From our summer memories to yours, cheers.